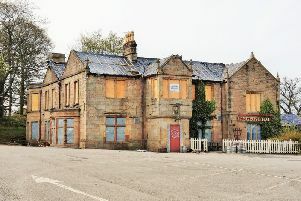 Exciting plans to breathe new life into the former Old Red Lion pub in Burnley have had time called on them this week. Ambitious plans to restore a landmark pub to its former glory in Burnley town centre have had time called on them...by the brewery that owns it. Property developer Ian Walker was on the verge of exchanging contracts to buy the former Old Red Lion pub when he discovered a covenant in the contract placed by the owners, Thwaites Brewery, that the building could not be used for the sale of food or alcohol. Property developer Ian Walker outside the former Old Red Lion pub in Burnley which he had hoped to transform into a tapas or bistro bar. The clause ended his plans to bring the former pub back to life as a tapas or bistro bar on the ground floor with luxury apartments on the first floor or even a boutique hotel that Ian was considering. Crushed by the news, Ian, who has bought several properties in the town centre, said: "I am absolutely gutted. "This is a beautiful old building that is crying out to be brought back to life and the plans I had would have been perfect for it to bring more people into Burnley. "This was a project I was very passionate about." Ian stands below the stone carving of a lion's face outside the former Old Red Lion pub in Burnley which he had hoped to re-open. News of Ian's plans were shared on social media and hundreds of people gave it their backing saying it was time the iconic building, situated in the heart of the centre at the foot of Manchester Road, was re-opened. Ian had already spent around £10,000 drawing up architects' plans for the re-development, including installing outdoor seating, and he was planning to re-name the pub the New Red Lion. The property is on the market with Trevor Dawson estate agents with a £295,000 price tag. He added: "The covenant is not visible and if it had have been I wouldn't have pursued these plans from the start." But in a statement released this week Andrew Buchanan who is the Director of Pubs and Brewing at Thwaites, said:“We have always been very open about the covenant on the Red Lion, so it shouldn’t have come as a surprise. “There are a number of other pubs in the vicinity, including the Swan which is immediately adjacent, and the White Lion, who are all working hard to maintain a sustainable living in the town, which is becoming an increasingly competitive marketplace. But Ian insisted that his plans for the Old Red Lion would not force other hostelries to compete adding: "We are in the 21st century and this is called urban living. "I have done my research and people want to live in town centres and have these facilities on their doorstep. "Burnley is buzzing at the moment and on the up with more coffee bars, wine bars and eateries that simply brings more people into the town, not less." Ian, who bought another landmark building in the town, the former Burnley Express building in Bull Street, which he has converted into 13 apartments and four retail units, said he would not give up on his Red Lion plans yet and was willing to go back to the drawing board. He added: "Perhaps Thwaites may be open to the idea of a place with just a coffee licence or somewhere selling only bottled beers." The Old Red Lion closed in 2010 after enjoying around 20 years as one of the most popular pubs in the town centre. It later re-opened as Decadence nightclub for a couple of years then in 2015 it became Craft Cafe Bar but closed after a short time. It was founded as a pub in the 17th century and was later bought by the newly formed Burnley Council in 1865 who demolished the building. Plans were on the cards for the site to become the home of the new town hall but when they fell through in 1868 the current building was erected coinciding with the widening of Manchester Road. It has been a Thwaites pub since the 1880s.